In the mid-19th century, no one could have foreseen what would become of their modest settlement. Alpharetta has since matured to be one of the most desirable places to live – anywhere in the U.S. – which comes as no surprise to Georgians. Evidence of that fact can be seen by the influx of new settlers to these parts. The 12th-largest city in Georgia is also the sixth fastest growing in the entire country. The population swelled by 7.8 percent between 2010 and 2012, and there was 11 percent growth from 2014 to 2015. Today, more than 60,000 souls call Alpharetta home. But this is no average bedroom community with nothing going for it but bedrooms. Nearly 5,000 businesses are planted here, more than 600 of which are tech companies, and more continue to come. As business expands, so does the need for workers; the more workers commute to Alpharetta, the more they realize how much they’d love to live here. The average citizen here is well educated; most adults hold college degrees, and the high school rates in the state’s top 15. With median household incomes exceeding $90,000, Alpharetta boasts the lowest unemployment rate in the state. A stagnant future is not in the cards for these folks. For a while, the quaint, quintessential Southern town did seem to be morphing into just another Atlanta suburb flanked by strip malls and big-box stores. Considering Alpharetta’s significance to local, statewide and national economies, it became clear to all concerned that this was no way to treat the venerable little city. So a few years ago, Alpharetta city officials and developers figured it would be a good idea to give the downtown a makeover, as a starting point for further expansion. To retain the “townsy” vibe and emphasize the walkability so coveted by much of the city’s growing Generation-X and Millennial demographics, development here would preserve historic buildings and landmarks, accommodate more mom-pop shops and encourage public use of green space. Alpharetta City Council shared the plan with local voters, who later that year approved a $29 million bond levy to move forward with it. Ground was broken in spring 2013, beginning with the razing of existing structures, making way for a shiny City Center on the 25-acre site. The new City Hall opened in December 2014, sporting the look originally intended. 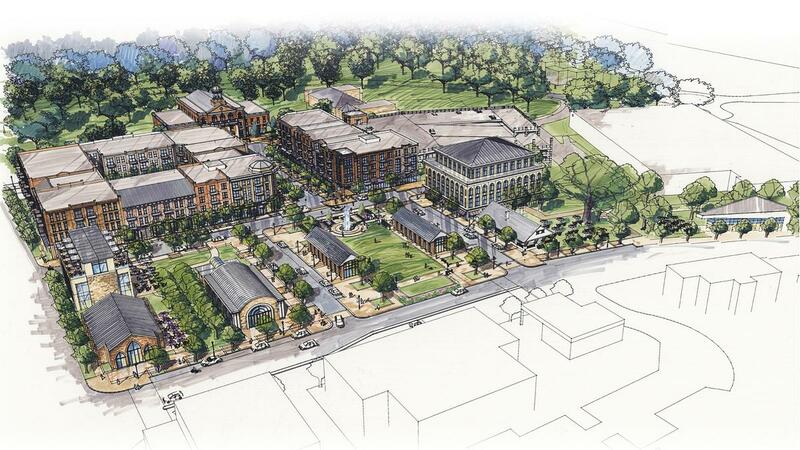 Phase II of the project would include more retail and office spaces, a parking structure and housing units. The first new restaurant is expected to open as soon as this fall. The 200-or-so luxury apartments and single-family homes being built downtown represent a rather small percentage of about 2,000 new residences currently, or about to be, under construction within Alpharetta’s city limits. The overall Master Plan includes these and existing neighborhoods, and seeks to foster greater community through enhanced connectivity. Whether on foot, by bike or via some form of motorized transportation, people will have easy access to various parts of the city. A half-mile east of downtown Alpharetta is Avalon, a $600 million mixed-use complex geared toward high-end retail and residences. It’s not a stretch to assume some of its patrons will be attracted to the City Center, where the pace will be more relaxed. The vision for downtown includes boutiques and chef-driven restaurants, perhaps even with rooftop dining; the city would have all the amenities with none of the pretentiousness. Home sales nationwide were disappointingly low in February. Of course that all depends on where you live; the most notable declines were felt in the Northeast and Midwest. However, the South seems to be a top destination for relocation; Forbes listed Alpharetta at No. 1 on its list of best cities for doing so, and that was in 2009. Since then, the city regularly has been named to one list or other, usually touting its business-friendliness: best small city to start a business, for working parents, for women entrepreneurs, etc. … and there are a lot of et ceteras. Demand is high for homes in and around Atlanta. According to the Atlanta Board of Realtors®, 3,246 homes were sold in the city in February, a year-over-year increase of 6.1 percent. Inventory, on the other hand, fell 4.2 percent for the same time period, with 13,046 active listings. Home prices rose 4.4 percent to a median sale price of $216,000. That left about a three-month supply of homes in Atlanta. When the market is not balanced (i.e., at least a six- to eight-month supply), listing prices go up and sellers get the upper hand. The numbers are even better for Alpharetta. In the past year, home values have risen 5.8 percent to a median of $357,500; in terms of square footage, the median jumped from $124 a square foot to $137 a square foot. Some predict this year will see value increases of 4.4 percent to as high as 6.3 percent. Even renters are being forced to recognize what Alpharetta investors have known for a while. Whereas the average rent in 2013 was $1,650, today that average is $2,164. With last winter’s Fed hike, mortgage interest rates have yet to show any signs of a spike, as many have been fearing. Freddie Mac reported in February that the rate for a 30-year fixed-rate mortgage was 3.66 percent, down from 3.87 percent the previous month, and the lowest it’s been since last April’s 3.67 percent. Despite economic recovery throughout the country, many still feel their situations are precarious. That doesn’t seem to be the case in Alpharetta. Whether you were born here or moved here, everyone adopts Alpharetta as their own “hometown” and that makes for a special optimism that is unbeatable for this once small city’s future.